Home > Paper Chase, St Louis 2014	> A St. Louis Paper Already Online: The Roman Flagrum . . .
A St. Louis Paper Already Online: The Roman Flagrum . . . The contents of this paper have been presented on the occasion of the international St. Louis Shroud Conference (The Controversial Intersection of Faith and Science), held in St. Louis on October 9th-12th, 2014. The paper has been anticipated here, waiting for the official Proceedings. The paper is The hypotheses about the Roman flagrum that was used to scourge the Man of the Shroud. Some clarifications by Flavia Manservigi and Enrico Morin. 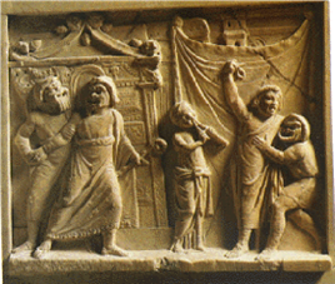 In the Roman world many different instruments were used to inflict chastisements through flesh beating. The use of the different tools was determined by the gravity of the crime, but also by the social class of the prisoner and by its nationality. The lowest level of this punishment was carried out in schools, against undisciplined children: in this case was used an instrument called ferula, which was a thin stick or a flat leather strip (Martial, Epigrammata, X, 62; 14, 79; Juvenal, Saturae, I, 15). Another instrument which could be used for the domestic punishment was the so called virga (Juvenal, Saturae, VII, 210); in the case of serious crimes, it could become an instrument of death. It was a small rod made of elm or birch, which could be used singularly or joined together; in this form, virgae were also carried by the lictors as symbols of the juridical and administrative authority of the magistrates, because they were used to flog criminals (Cicero, In Verrem, 2, 5, 140; Livy, Ab Urbe conditam, II, 5; XXVI, 15-16; XXVIII, 29; XXIX, 9; Pliny the Elder, Naturalis Historia, XVI, 30, 75; Acts of Apostles, 22, 24-29).
. . . and it goes on from there. Fascinating. Do read it. I really enjoyed this paper, the author filled in a gap in shroud research and managed to find an actual specimen from the first century that could inflict wounds very close to the ones we see on the shroud. Offcourse most whips were made from leather and thus cannot survive to our time. But her research shows that the wounds are consistent with first century tools of torture. I agree, a most entertaining read this early in the morning.